I was writing earlier this morning about the Berliner Dom, popularly known as Berlin Cathedral. But the Berliner Dom has never been a cathedral, in the proper meaning of the term. But the seat of the Bishop of Berlin and the centre of the diocese is Saint Mary’s Church, or the Marienkirche, on Karl-Liebknecht-Straße, formerly Kaiser-Wilhelm-Straße, near Alexanderplatz, in central Berlin. The Marienkirche is the oldest surviving parish church in the city of Berlin that is still in use as a church. It is situated beside the TV Tower or Fernsehturm and among the high-rise blocks built in the East German era. The Marienkirche is often associated with the Nikolaikirche, the remnants of the Franziskaner-Klosterkirche and the chapel of the Heilig-Geist-Spital, all of which were built in the early stages of Berlin’s urban history. But, apart from the Nikolaikirche, the Marienkirche is the oldest church in Berlin. The building of the Marienkirche began shortly after Berlin was granted town privileges in 1230. It was probably built some time ca 1250-1280 as a parish church for the newly established town – the exact date is not known, but it was first mentioned in chronicles in 1292. The Marienkirche is built on foundations made of fieldstones, and the church itself is built with red bricks in the local Brick Gothic style. The internal architectural design is based on the design of the churches of the mendicant orders, who inspired many town churches at the time. This is a long hall church with thee naves. Wide arches and arcades make the comparatively low-ceilinged church look bigger. Cup-shaped compound piers adorn the interior. The oldest parts of the church are made from granite, but most of it is built of brick, giving it its characteristic bright red appearance. This was deliberately copied in the construction of the nearby Berlin City Hall, the Rotes Rathaus. The Church of Saint Mary was damaged by one of the many fires in Berlin in the late 14th century and it was rebuilt in a modified form. The church tower, made of Rüdersdorf limestone, was repaired and modified from the 15th century. 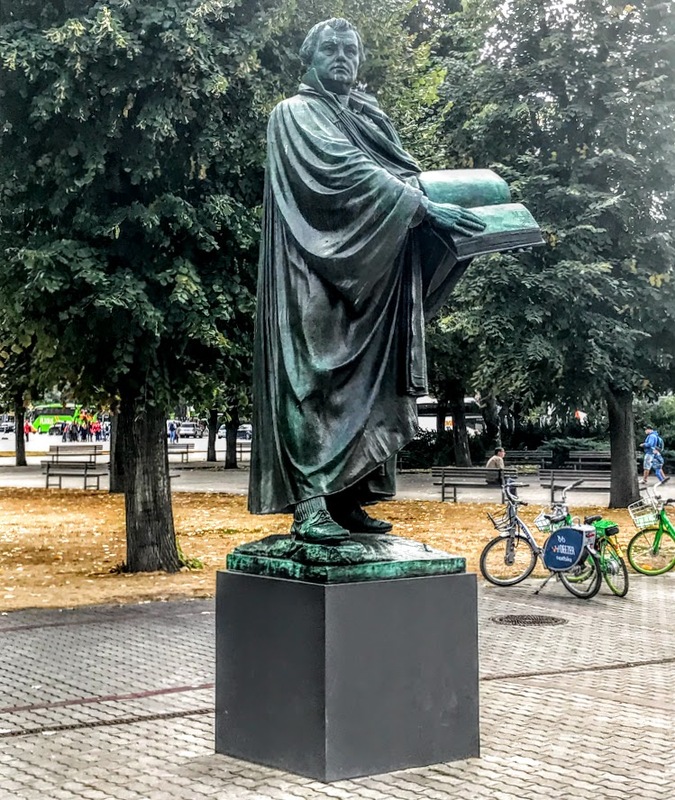 The mediaeval Marienkirche has been a Lutheran church since the Reformation, and there is a striking statue of Martin Luther outside the church. Michael Mathias Smids redesigned the church in the Baroque style in 1663. The imposing, decorated pulpit was carved from alabaster by Andreas Schlüter in 1703. In addition, the church has a massive pipe organ over the main door. Baron Carl Hildebrand von Canstein, founder of the oldest Bible society in the world, the Cansteinsche Bibelanstalt, was buried here in 1719. 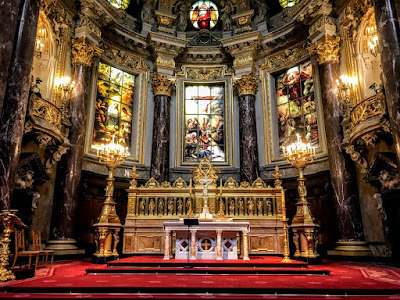 The baroque altar was designed by Andreas Krüger around 1762, with paintings by Christian Bernhard Rode. A complete neo-Gothic overhaul was carried out in 1789 by the celebrated master builder Carl Gotthard Langhans. His best-known work is the Brandenburg Gate on Pariser Platz. He also designed the large metal dome in the Baroque and neo-Gothic styles that crowned the bell tower in 1790. The church has been a united Protestant church since the Prussian Union of Churches in 1817. 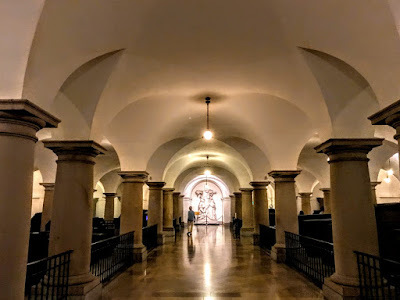 The architecture of the building is now largely composed of comparatively modern restoration work that took place in the late 19th century and in the post-war period. The church has a number of important works of art inside, some dating back to the 15th century. Many of these were collected from other churches that were either destroyed during World War II or degraded over time because of age. The painting Der Totentanz (The Dance of Death), painted in 1475, was found in 1860 beneath a layer of whitewash in the church’s entrance hall. This fresco is more than 22 metres long and 2 metres high, and dates from a time when the plague in Berlin caused many deaths. The remaining fragments, displayed behind glass, depict the dancing dead representing people from all walks of life. Before World War II, the Marienkirche was in the middle of a densely populated part of the district of Mitte, and was in regular use as a parish church. But the church was heavily damaged by Allied bombs during World War II. After World War II and the division of Berlin and Germany, the Marienkirche was in East Berlin. The church was restored by the East German authorities in the 1950s, and the area around the church was cleared of ruined buildings. The cross on the top of the church is said to have annoyed the Communist rulers of East Germany – its shape was always reflected in the windows of the television tower or Fernsehturm, built in 1965-1969 by the East German government as a symbol of both Berlin and of East Germany. The oldest church in Berlin is the nearby Saint Nicholas’ Church or the Nikolaikirche in the area known as the Nikolaiviertel or Nicholas quarter. The Nikolaikirche was built in 1220-1230, but held its last service 80 years ago on Reformation Day, 31 October 1938. The church building served was handed over to the government, and the congregation merged with that of Saint Mary’s Church. The roof and the tops of the towers of the Nikolaikirche were destroyed by Allied bombing in World War II, and the vaults and northern pillars collapsed in 1949. The church has since been rebuilt and now mainly serves as a museum and as an occasional concert venue. Today, Marienkirche is the church of the Bishop of the Evangelical Church of Berlin-Brandenburg-Silesian Upper Lusatia, while the Berliner Dom or Berlin Cathedral is under joint supervision of all the member churches of the Union of Evangelical Churches. It is also used for Anglican services on Sunday evenings. 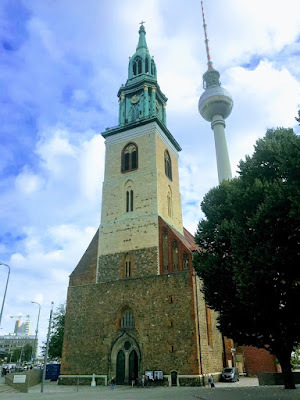 The Marienkirche, once hemmed in by other buildings, now stands in the open spaces around the Alexanderplatz, overshadowed by the Fernsehturm, yet it retains its mediaeval atmosphere in the middle of modern high-rise buildings. After visiting the Pergamon Museum and Museum Island in Berlin this week, I spent some time in the Berliner Dom or Berlin Cathedral, which also stands on Museum Island in the middle of the River Spree. With its central copper dome rising to 98 metres, it stands out above the park before it and the surrounding streets. This neo-baroque cathedral was designed by Julius Raschdorff (1823-1914), one of the leading German architects of the second half of the 19th century. The magnificent dome is one of the main landmarks in Berlin’s cityscape. 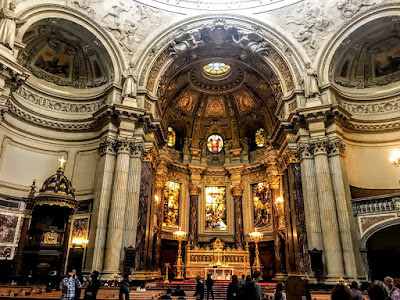 Inside, the cathedral attracts a constant flow of visitors with its elaborate decorative and ornamental designs and the dome that offers panoramic views across the city. Although technically it is not a cathedral, for it is neither the seat of a bishop nor the principal church in a diocese, the churches on this site have been known as the Dom (cathedral) down through the centuries, and it was once the court church of the Hohenzollern dynasty, the rulers of Prussia and later the German Emperors. Officially this is a ‘Supreme Parish and Collegiate Church’ and has the status of a parish church. Its history dates back to the 15th century, when the chapel of the new royal city palace was elevated to the status of a collegiate church. In 1451, the Prince-Elector Frederick II Irontooth of Brandenburg moved from Brandenburg on Havel to a new city palace on the southern part of what is now Museum Island and which then also had a large chapel. After a pilgrimage to Jerusalem and a visit to Rome on the way back home in 1454, Frederick Irontooth had the chapel raised to the status of a parish church, and richly endowed it with relics and altars. Pope Nicholas V ordered Stephan Bodecker, then Prince-Bishop of Brandenburg, to consecrate the chapel to Saint Erasmus of Formiae. In 1465, the church became collegiate church with an elaborate dedication and endowed with income to support a college of eight prebendaries or canons Ever since, it has been known as a collegiate church (Domstift) or cathedral church (Domkirche). In 1536, the Dominicans or Black Friars were forced to move from the area to a new house in Brandenburg and their church was assigned to an enlarged collegiate church with 12 prebendaries or canons, From 1545, on the electoral family of Hohenzollern also used the church as their burial place. Withn the Reformatio, the Elector Joachim II Hector became a Lutheran in 1539, and the collegiate church became a Lutheran church. Despite these changes, he enriched the church with luxurious furnishings, including monstrances, relics, chasubles and carpets. A year after his accession to the throne, Prince-Elector John Sigismund, then a crypto-Calvinist, dissolved the college in 1608 and the church was renamed the Supreme Parish Church of Holy Trinity in Cölln. John Sigismund publicly became a Calvinist in 1613, although his wife Anna and most of his subjects remained Lutherans. Berlin’s other churches remained Lutheran too, but the Supreme Parish Church of Holy Trinity, the Hohenzollern house church, became Berlin’s first – and until 1695, only – Calvinist church. From 1632 on, it was the parish church for all Calvinists in Berlin, and as a Calvinist church, the patronage of the Holy Trinity was increasingly dropped in all references to its name. The dilapidated double-tower façade was torn down in 1667 and Martin Böhme erected a new baroque façade with two towers in 1717. 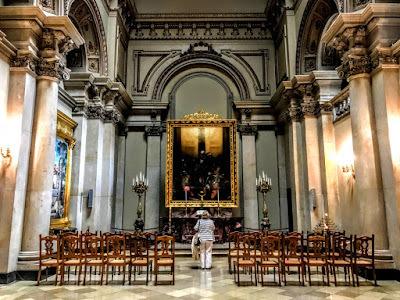 The Supreme Parish Church was demolished in 1747 to clear space for the baroque extension of the Berlin Palace, and a new baroque Calvinist Supreme Parish Church, built in an area north of the palace by Johann Boumann the Elder in 1747-1750, opened in 1750. During the reign of King Frederick William III of Prussia, the community of the Supreme Parish Church joined a new church uniting Prussian Calvinist and Lutheran congregations in 1817, and from 1821 this was known as the Evangelical Church in Prussia. To mark this union, Prussia’s leading architect, Karl Friedrich Schinkel (1781-1841), was commissioned to transform the court church into a neo-classical building in 1820-1822. However, within half a century, tastes in church architecture had changed in the royal court. In Prussia, there was no separation of Church and State, and when Wilhelm II came to the throne as Emperor of Germany in 1888, he also became the summus episcopus or ‘Supreme Governor’ of the Evangelical State Church of Prussia’s older Provinces, as the united church was named from 1875. The new emperor found Schinkel’s church was far too modest, and insisted on a new monumental church in keeping with the imperial monarchy’s power and prestige. Several designs were put forward for a new church, but none had been accepted. Raschdorff was commissioned to design the new church, but he had to present three designs before Wilhelm II was satisfied. his opulent, grandiose structure would be Berlin’s answer to Saint Peter’s Basilica in Rome and Saint Paul’s Cathedral in London. The old building was demolished in 1893, and the foundation stone for the new church was laid in 1894. The new church was consecrated 11 years later in 1905. Raschdorff drew his inspiration from the Italian High Renaissance and the more florid baroque style. With its lavish mix of ornamental mosaics, gold features and impressive statues, the octagonal interior is clearly informed by the late 19th century’s love of grand gestures and display. Today, it is a major work of Historicist architecture of the Kaiserzeit. 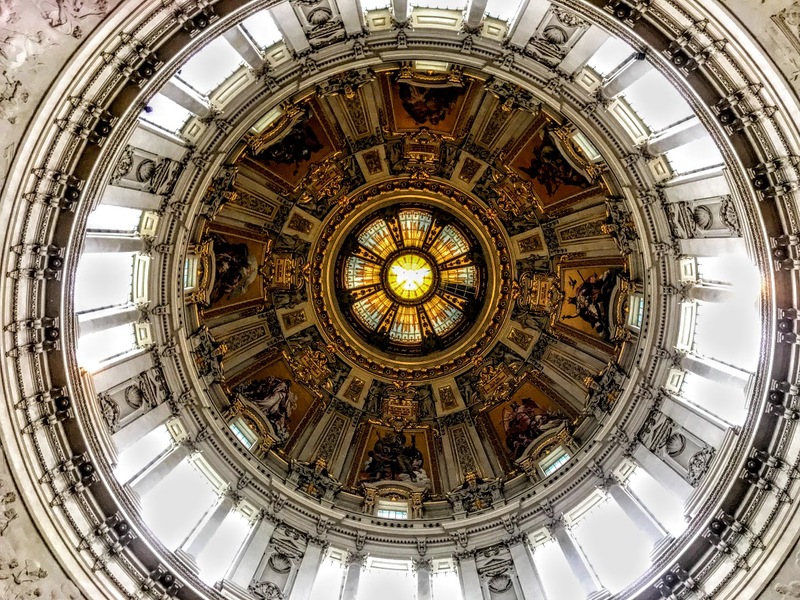 The Berliner Dom is dominated by its monumental dome soaring above the main nave, crowned by a lantern with a golden cross and flanked by four towers. Inside the church, the eight mosaics in the dome by Anton von Werner depict the Beatitudes in the Sermon on the Mount. The statues on the ledges above the half columns represent the four Continental Reformers, John Zwingli, Martin Luther, Philip Melanchthon and John Calvin. Four red sandstone reliefs by Otto Lessing depict scenes from the Acts of the Apostles. The altar, in white marble and yellow onyx, was designed by Friedrich August Stüler. 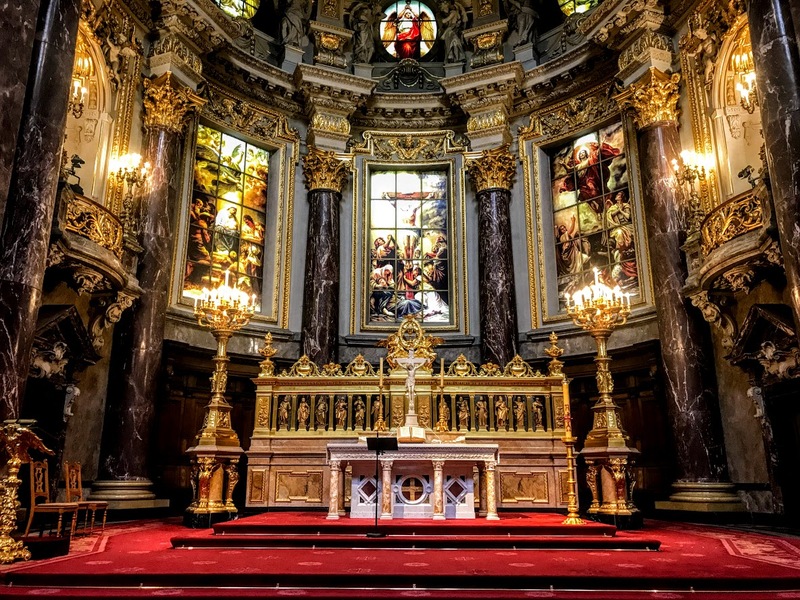 The gilded bronze reredos with the 12 Apostles was made by Karl Friedrich Schinkel, and was part of the choir screen in the earlier cathedral. There are two ceremonial candle holders made of gilded iron, both by Schinkel. Above the altar, three stained-glass windows depict the Nativity, the Crucifixion and the Resurrection. The pulpit is in carved oak, and the white marble baptismal font is the work of Christian Daniel Rauch. 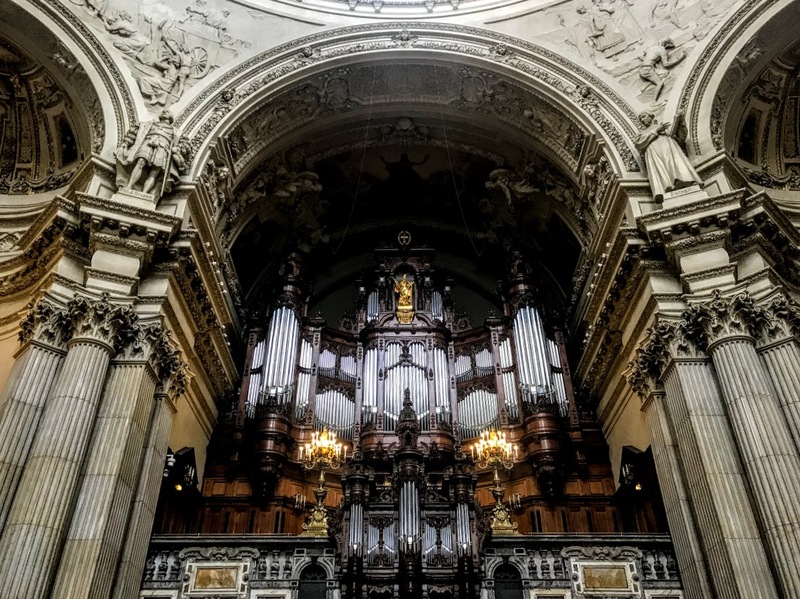 The pipe organ, built by Wilhelm Sauer, which has been fully restored, has 113 stops, 7,269 pipes and a four-manual console. It is the largest and most important organ with pneumatic action from the German Late Romantic period. The baroque ceremonial sarcophagus below the organ loft is for the Prince Elector Friedrich Wilhelm and his second wife Dorothea. Here too are the bronze mediaeval grave monument of Prince Elector Johann Cicero, the marble funerary monument of Kaiser Friedrich III and the golden ceremonial sarcophagus of King Friedrich I and Sophie Charlotte, both by Andreas Schlüter. In contrast, the simpler Baptismal and Matrimonial Chapel is more meditative, inviting visitors to stop, rest, reflect and pray. Here, the painting of the Descent of the Holy Spirit by Carl Begas the Elder is in the style of Raphael. The richly decorated Imperial Staircase was intended for the use of the German Emperor. The stairwell comes with an American-made elevator included at the request of Kaiser Wilhelm II. The museum displays drawings, designs and models illustrating the history of the cathedral. From here, I climbed the 270 steps to the dome’s outer walkway, and was rewarded with panoramic views of the city. Below the cathedral, the Hohenzollern Crypt, the most important dynastic sepulchre in Germany, contains nearly 100 sarcophagi and burial monuments from four centuries. Some are plain and simple, while others are extremely ornate, including the sarcophagi carved by Schlüter for Friedrich I and Queen Sophie Charlotte, which are masterpieces of baroque sculpture. The only Hohenzollern ruler not buried here is Kaiser Wilhelm II, who abdicated at the end of World War I in 1918. He is buried in a mausoleum in the grounds of his house in the Netherlands, where he died in exile. The church was severely damaged during World War II. In 1940, the bombing blew away part of the windows. On 24 May 1944, a bomb destroyed the roof lantern of the dome. The fire could not be put out, and the lantern burnt out and collapsed into the main floor. After World War II and the division of Germany, the Cathedral Church was in East Berlin. A temporary roof was built in 1949-1953, to enclose the building. Work began on restoring the church in 1975, although in a simplified form. The baptistery and wedding church was reopened for services in 1980, and the restoration of the nave began in 1984. The full restoration was not completed until 1993, four years after the fall of the Berlin Wall. The nave was reinaugurated on 6 June 1993, in a ceremony attended by the Chancellor, Helmut Kohl. A new golden cross placed on the dome in 2008, replacing a more simple one from the East German period. In recent years, there has been talk about restoring the dome and the cupolas to their original appearance, but this has not happened because of a lack of funds. 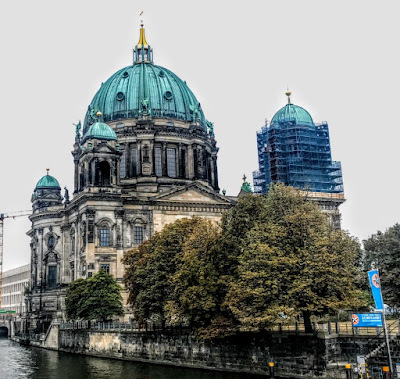 Today, Berlin Cathedral is officially the Evangelical Supreme Parish and Collegiate Church in Berlin (Oberpfarr- und Domkirche zu Berlin). The Dom is a parish church and a member of the Evangelical Church of Berlin-Brandenburg-Silesian Upper Lusatia. Of course, Berlin Cathedral has never been a cathedral, and has never been the seat of a bishop. The bishop of the Evangelical Church in Berlin-Brandenburg is based at the Marienkirche or Saint Mary’s Church, a few steps away on Karl-Liebknecht-Straße (formerly Kaiser-Wilhelm-Straße). Sundays and public holidays: 10 a.m., Holy Communion (with English translation) and Children’s Service; 6 p.m., Service with sermon and hymns (Predigtgottesdienst). Monday to Saturday: noon, Midday worship; Monday to Friday: 6 p.m., evening worship (Thursdays, Evensong in English and German); on one Thursday evening a month (usually the second Thursday), Taizé Worship.